Butterfly Canyon is another little-visited gorge that cuts across the northern edge of the sandy, rocky Kaibab Plateau south of the Navajo Creek arm of Lake Powell, on land which is part of the Navajo Reservation and has few roads and only scattered habitation. 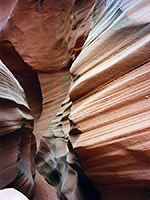 The canyon has two sections; an upper half-mile stretch with short narrows, quite shallow but still pretty, and then, beneath a 200 foot sheer drop, another 2 miles of wonderful passages with muddy pools, large boulders, other dryfalls of up to 15 feet, lengthy narrow, twisting sections and an assortment of graceful rock formations. Butterfly is one of the more difficult of Lake Powell slot canyons to explore as the journey is quite strenuous; route-finding and rock-climbing skills are necessary and ropes are required to progress all the way down the canyon to the lake. The canyon is reached by driving along a track which leaves AZ 98 and soon curves east towards a cluster of houses. A left turn continues northwards, and after 2 miles progresses to the end of a low escarpment, a place ideal for camping with uninterrupted views all around, including the red sandstone butte known as Leche-E Rock, sacred to the local peoples, the convoluted, multi-hued rocky land around Lake Powell with the distinctive outline of Navajo Mountain 25 miles beyond, and wide, empty desert plains in all other directions. Sunsets here are particularly impressive, and at dusk only a very few distant artificial lights are visible. The road continues down the far side of the ridge although with a sandy, rutted section that may require a 4WD vehicle to negotiate - it is certainly not passable by a 25 foot RV, although I tried, and had to reverse out. 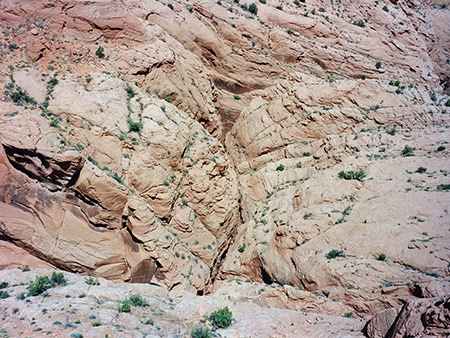 So, travel on foot may be necessary; after a walk of 2 miles further along the track the canyon is alongside to the left and about half a mile distant - to reach the edge requires hiking across the sand and slickrock, and climbing down a few intermediate cliffs. The road is good for most of the last 2 miles but deteriorates near the end. Not currently available; like all other narrow canyons in the area, Butterfly Canyon has been officially closed since 1998, although it may be possible to visit the local Kaibito chapter house in person and obtain special permission. 10 views of Butterfly Canyon. 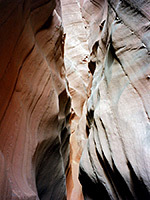 The suggested approach leads to the upper section of the slot canyon. At some points this is enclosed by sheer cliffs up to 30 feet high, while at others it is easy to find a route down. Upstream are some nice curvy narrows, a probability of several pools following recent rainfall, and some shaded passages where sticky mud persists for some time after a flood. 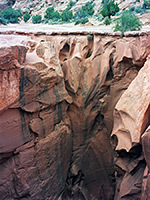 The canyon ends abruptly beneath the edge of the Carmel rim, a sandstone layer of greater resistance than the underlying Navajo formation. The entry point for Butterfly Creek waters is a though a small, twisting slot in the cliffs, 20 feet above. Downstream, the canyon becomes shallow and wide, the cliffs at either side fall away and the watercourse spreads out over a flat rock layer, with nothing to indicate the spectacular drop that lies ahead, for after 50 yards of level terrain, and out of sight until just a few yards away the rock plateau ends abruptly and the canyon continues 200 feet below. 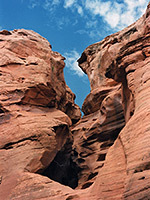 Directly beneath the dryfalls are several deep pools amongst a medley of sandstone fins, circular potholes and other curved formations; although such falls are common in slot canyons, this one is particularly abrupt and dramatic. It is impossible to climb down at this point but after 20 minutes rim walking on the east side, a steep scree-covered slope does provide a route down to the streambed. Hiking further downstream is never particularly easy, especially after recent rains when frequent pools and long patches of deep, slippery mud hinder progress. There are several boulders with drops of 6 feet or so, plus at least 3 places where the canyon has dryfalls of up to 15 feet - here a rope would be useful although with care it is possible to climb down. 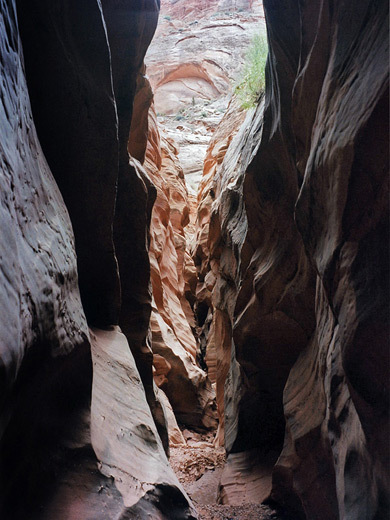 Butterfly is not continuously narrow, as is the case with other nearby slot canyons such as Starting Water Wash or Upper Kaibito Creek - rather there are short narrow passages interspersed by longer, more open sections with a few potential climbing out routes out at either side. Beyond the third of these drop-offs, the canyon floor narrows to a sharp V-shape and curves out of sight, soon reaching several higher drops where ropes must be used to continue. For those not equipped for rappelling there is a climb-out point a short distance back up the canyon on the east side, just above the second dryfall, and a steep ascent of 15 minutes to the top of a small plateau near the canyon edge is rewarded by a great vista of jumbled, eroded red rocks in all directions with the black shape of Navajo Mountain looming beyond. There is no immediate sight of Lake Powell when following the canyon northwards at rim level, as its waters are enclosed beneath deep cliffs. It takes a little care to relocate the track that leads back to AZ 98, and the walk through the sandy desert is quite tiring especially in the heat of summer. A round trip, including the walk to the ridge half way back to the main road takes around 5 hours.